A bill that would increase the sales tax on cigarettes by $1.50 passed a House budget committee by a 19-9 vote and later cleared the state Senate’s budget committee on a 10-2 vote, Tuesday. Democrats complained they only learned know the details of the plan just three minutes before the meeting. Republicans, they said, had close to two months to review the proposal. Language in the proposal was vague. Money generated by the tax would be given to various healthcare services without listing any specific agency. Committee Chairman Kevin Wallace, R-Wellston, pushed for the bill’s passage. 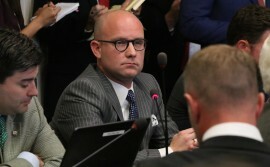 House Minority Leader, Rep. Scott Inman, D-Oklahoma City, objected to the bill. Inman said the measure didn’t raise enough money. Records show House Bill 1099 would only generate $129.8 million, because the measure is being considered so late in the year. That presented a problem for Inman. Inman asked where the remaining $85.2 million was coming from. Wallace said lawmakers could tap into the General Revenue Fund and the Rainy Day Fund. In addition to Inman, Rep. John Bennett, R-Sallisaw, said he opposed the bill. State agencies, Bennett said, should be audited for over-spending and any tax proposal should go to the people. Bennett was echoed by Inman. Lawmakers were forced into a special session after the Oklahoma Supreme Court ruled in June that the original $1.50 fee was unconstitutional. Republican Governor Mary Fallin signed an executive order to start a special session. State Senator John Sparks, D-Norman, questioned the language of the document. Along with Sparks, outgoing Senator Dan Newberry, R-Tulsa, said the measure wasn’t fair to taxpayers. The final vote was 10-2. The bill was expected to go before the full Senate today, however shortly after 10 a.m., House Speaker Charles McCall, R-Need Hometown, announced the special session was on hold. McCall said the House would stay in recess until a budget agreement was reached.